I will recommend CodeBlock IDE with MinGW compiler as they are freeware and quite professional. Beginner can learn alot with this IDE. First page has been updated as of 07/Sept/2011. 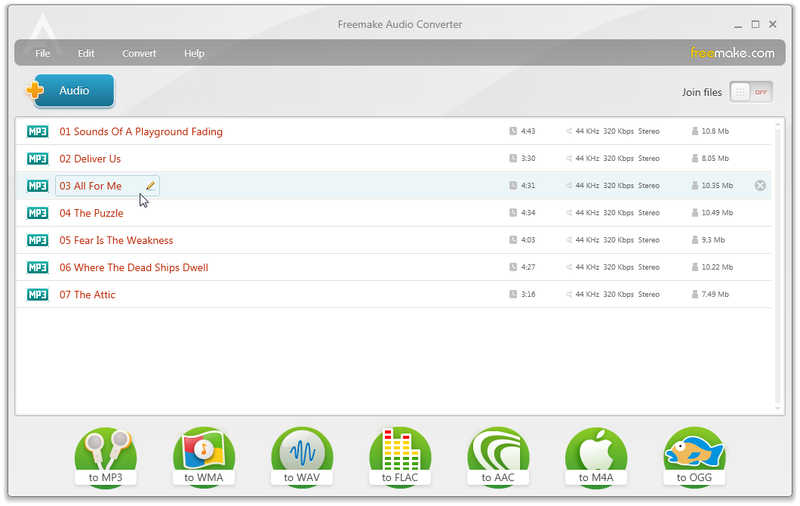 Product Description/Features: Convert audio free to MP3, WMA, WAV, FLAC, AAC, M4A, OGG, convert audio to MP3 player, iPod, iPhone, iPad, PSP, extract audio from video, join audio files. Product Description/Features: QCopy is a file copier designed to assist the user in copying files to or from network locations over wired and wireless connections, although it also works locally. It allows you to queue up any number of files, from any number of locations, and copy them to a specific destination on the fly. You can pause and resume at any time, skip files or save the queue for transfer later. Product Description/Features: ToeTag is all you need to edit the tags in most popular music files. If you are using MP3, WAV, WMA, OGG, Apple AAC (M4A), FLAC, or other audio files, ToeTag is a must-have utility. Get song information on-line from the free tracktype.org server. Use information from the filename to fill in tag data. Organize your collection by renaming or moving files based on song tags. Edit less common tags like composer, conductor, and more. Advanced features like automating common tasks. Updated with another free freewares. new video converter around that seems to be even better than format factory. anyone know is there any free PDF to Excel converter? try the free online converter . It has in-built Codec Finder. yeah the in built one works but no prediction and all that quite troublesome. after using google pinyin is not too good in my opinion, i prefer sogou pinyin or tenacent pinyin which has more predicted verses, it just types beter in my opinion. use it to type for work as well, works better than others in my opinion. Updated list on first page. Find this rather useful for youtube downloaders. Description: New Free Studio Manager is a completely redesigned all-in-one package for our programs. It contains 8 sections to bundle all free multimedia applications which have been developed by DVDVideoSoft. These sections the following: YouTube, MP3&Audio, CD-DVD-BD, DVD&Video, Photo&Images, Mobiles, Apple Devices, 3D. Thus all the programs are included in the new interface for easy access to any of them. With this free software you can convert video and audio files between different formats and to iPod, PSP, iPhone, BlackBerry and all popular mobile phones and devices; burn and rip DVDs and audio CDs; upload and download YouTube videos and music to your computer, iPod, PSP, iPhone and BlackBerry; perform basic editing of audio and video files as well as record videos and make snapshots. I found a software written in java that support's playing MP3/WAV/FLAC/MOD/AC3/MIDI(with support to .SF2 banks) and more files in 24/32bit and 5.1/7.1 surround speakers with automatrix conversion support (stereo -> 5.1/7.1 surround). This software is freeware and is available in "zplayer.no-ip.org". Software plays nice in Windows/Linux with full support to DirectSound/ALSA. Last edited by zankuro; 30-07-2012 at 03:23 AM..